Are you ready to compete against the top academy riders in the nation? If so, we invite you to join us. Entry forms for our 2018 show are now available. All forms must be postmarked by September 28, 2019. To download an entry form, click here. Mark your calendar now and get ready for the academy show of the year. Our 2019 show schedule is coming soon. The NACHS would not exist without the generous support of our sponsor. All proceeds from our show go to St. Jude Children’s Research Hospital. If you’re interested in becoming a sponsor for our 2019 show, click here. All riders, instructors, and family members should read our show rules before the competition begins. To go to our rules page, click here. Do you have a favorite horse that you think is worthy to win our 2019 “Horse of the Year” award? Then enter them today! Click here for a Horse of the Year application. Riders at the NACHS compete in the spirit of friendly competition and to raise money for St. Jude Children’s Research Hospital. We encourage all of our riders to help raise money for St. Jude’s. For some clever ideas on how to raise money, click here. Murfreesboro, TN has many choices for overnight accommodations but our biggest tip is to book early, especially if you’re coming with a group. Click here to find out more about good local choices. Start training. Start visualizing your success. The National Academy Championship Horse Show is known for bringing talented, experienced academy riders from all over the nation. Safety is our #1 goal. We ask that all of our riders train to ride their horses in a controlled, safe fashion. For inspiration, see our prize list. The National Academy Championship Horse Show was inspired by the love of children and horses by Joyce Webster of B & W Stables. Our story began in 1999, when Joyce met a very sick little girl one day riding a horse at her barn. Even though the child was very ill, this little girl had the biggest smile on her face because she was riding a horse — this was the child’s dream come true! From that moment on, Joyce couldn’t stop thinking about this beautiful child and how happy being around horses made her. 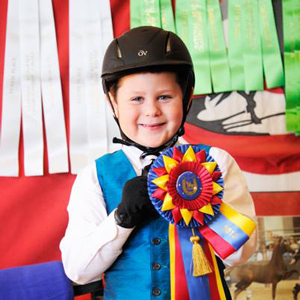 Joyce decided to create the National Academy Championship Horse Show and give all the proceeds to St. Jude’s to help children with life threatening diseases. Thanks to the generosity of many barns, riders, families, friends and our sponsors, this show has now donated over $458,900 to St. Jude’s to help sick children and fund critical research. A winning rider at the National Academy Championship Horse Show. 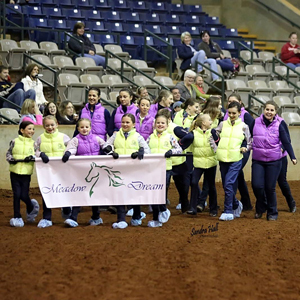 Riders parading at the Opening Ceremony of the horse show.